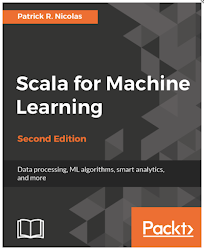 A brief introduction to the Bloom filter and its implementation in Scala using a cryptographic digest. However, the algorithm does not prevent false positive. For instance, a bit may have been set to 1 during the insertion of previous elements and the query reports erroneously that the element belongs to the set. The insertion of an elements depends on the h hash functions, therefore the time needed to add a new element is h (number of hash functions) and independent from size of the bit vector: asymptotic insertion time = O(h). However, the filter requires h bits for each element and is less effective that traditional bit array for small sets. The probability of false positives decreases as the number n of inserted elements decreases and the size of the bitvector m, increases. The number of hash functions that minimizes the probability of false positives is defined by h = m.ln2/n. The implementation relies on the MessageDigest java library class to generated the unique hash values. Ancillary methods and condition on methods arguments are ommitted for sake of clarity. The digest using the message digest of the java library java.security.MessageDigest. The next step consists of defining the methods to add single generic element add(any: Any) line 8 and array of elements add(elements: Array[Any]) (line 2). The contains method relies on a accessing an element from the set using the recursive getSet method. A recursive call to initialize the Bloom filter with an array if integers (line 9). 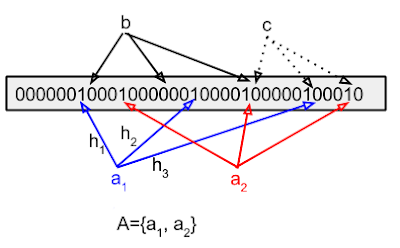 The hash method is the core of the Bloom filter: It consists of computing an index of an entry. The instance of the MessageDigestclass, digest generates a hash value using either MD5 or SHA-1 algorithm. Tail recursion is used as an alternative to the iterative process to generate the set. 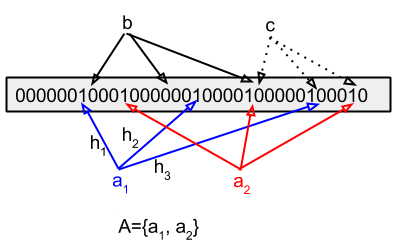 The conversion relies on the manipulation of bits from a 32 bit Integer to 4 bytes (line 6 - 8). Alternatively, you may consider a conversion from a long value to a 8 byte array. This simple test consists of checking if a couple of values are indeed contains in the set. The filter will definitively reject 22 and very likely accept 23. If the objective is to confirm that 23 belongs to the set, then a full-fledged hash table would have to be used. Let's look at the behavior of the bloom filter under load. The test consists of adding 100,000,000 new random values then test if the filter contains a value (10,000) times. The test is run 10 times after a warm up of the JVM. // Measure average time to test for a value. 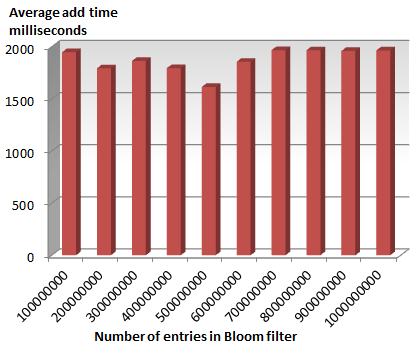 The first performance test evaluates the average time required to insert a new element into a Bloom filter which size range from 100M to 1Billion entries. 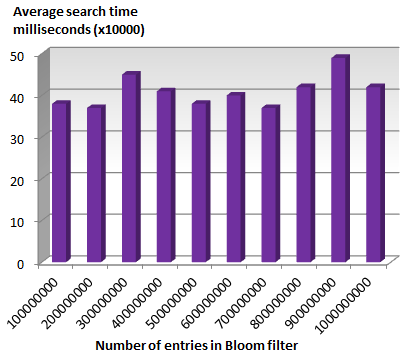 The second test evaluates the average search/query time for bloom filters with same range of size. As expected the average time to load a new set of values and check the filter contains a specific value is fairly constant.